Donnie Gill was working as a minor hired thug for Hammer Industries until businessman Justin Hammer gave him a battlesuit. After a series of failures at villainy, the Blizzard decided to join the Thunderbolts, a team of former superhuman villains who were attempting to reinvent themselves as a team of heroic champions. Gill was recruited as a founding member of the new team and earned a parole. The Thunderbolts made their debut by saving Manhattan from the terrorist attacks of renegade Atlanteans. 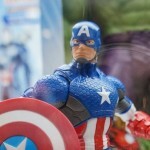 Related Dork Side Toys links: Marvel Legends Blizzard, All Marvel Legends, Newly Listed Hulkbuster Series Avengers Wave.